Horses, grapes, acreage, we insure it. We develop & deliver innovative insurance & risk management solutions for each client’s unique requirements. At Websters – Trusted Advisers, no one client or business is the same. We take the time to understand your unique requirements and appetite for risk. We listen to your needs and discuss risk management strategies that may benefit you. Once understood we build an Insurance Program that meets your specific requirements. We are thrilled to announce the release of our new mobile app. The app will gather all required information in the event of a claim and provide it to us at the click of a button. Contact us out of hours and we’ll get back in touch with you. Obtain Certificates of Currency and copies of important documentation. With our app you can access Home & Contents insurance calculators to help us determine what insurance requirements are right for you. We can handle all of your business insurance requirements. Professional Indemnity, Malpractice, Directors & Officers insurance for medical practitioners, allied health, engineers, lawyers, architects, accountants, surveyors & others. From the corner shop through to national franchises we provide market leading solutions to the retail sector. We’ve specialised in this industry for over 30 years. We place insurances for the smallest, micro-budget short film through to multi-million dollar feature films & TV series. We structure complex, bespoke Insurance Programs for listed & private companies with international scope. We build comprehensive Insurance Programs specific to each client’s needs, from raw materials through to the finished product. Contract Works, Builders Indemnity insurance for owner-builders through to complex engineering & civil contractors, we’ve got the solution. Specific solutions for mining services including engineering, gravity surveying & down-hole data logging services. From the smallest hobby farm to broad-acre cropping and thousand head livestock farming, we understand agribusiness. We provide market leading personal insurance solutions including Home & Contents, Motor Vehicle, Landlords, Caravan, Boat and all other personal insurances. Our broking team totals over 150 years combined industry experience, backed by an enthusiastic, detailed support group. Every member of our team is empowered to make decisions. We invest in our teams professional development to provide them with career choices & workplace flexibility. We are real people, with real lives, living in your community, not a distant call-centre. We have close relationships with all market leading Australian insurers, and the ability to access global markets as required. Great relationships lead to great outcomes. Our aim is to build lasting, personal relationships so that we understand your needs and can provide you with targeted advice, not weekly newsletters. We succeed in protecting our clients ability to succeed. Every client has access to our in-house claims management services. Our claims team consists of three staff members that coordinate the lodgement & settlement of all claims for our clients. We manage the ‘end-to-end’ claims process that delivers on our promise of excellent personal service. Our company has used Webster Hyde Heath for a majority of our insurance requirements for over 16 years. Steve and his staff have provided an excellent personalised service over all that time and we have never felt the need to look anywhere else. The company has stuck with us through the good times and the bad. It is when you realise you need to call on your insurance policies that you really see the worth of your insurance broker. Every time we had had an issue or claim or a need to refer to our policy, it has been handled personally and professionally and settled with a minimum of fuss. The company conducts regular reviews of our business and activities and has been able to tailor our policies and level of cover to suit our operating conditions and our financial capacity given the cyclical nature of our business. Steve and his staff have always been there supporting our business and we consider them much more than an insurance broker. They are a great partner and asset to our business and we would highly recommend you consider using Webster Hyde Heath as your insurance broker. Andrew has acted as my insurance broker and advisor for over ten years. During that time Andrew has worked closely with me to ensure that the three businesses owned by me and two businesses I subsequently managed held insurance cover that fully met their needs. In 2006 I was managing a business after its sale following thirty-five years of ownership. The business suffered a catastrophic loss in a large fire which completely destroyed the entire production facility. Within hours I discovered why maintaining the correct level of cover is so important. Our insurers were on site on the day of the fire. Clearing of debris commenced almost immediately and reconstruction began as soon as necessary approvals were obtained. Our insurers appointed a project manager and, in co-operation with us, pursued the aim of getting us back to full production within as short a time frame as possible. It soon became apparent that good insurance advice had ensured we had excellent cover and the level of service from the insurer involved was exemplary. From crisis to back-in-business was, while not without technical headaches, a process which was facilitated by our insurer. It was conveyed to me at the time, and I continue to believe, that our insurance broker had ensured we had the best levels of cover for our business. Our acceptance of his advice saw the business back in production in a new building and new production plant in a time I would not have believed possible. I have no hesitation in commending Andrew to any business considering his services. Well-earned trust, we’ve been very comfortable with Steve and the team at Websters for over 20 years. Trust is what it’s all about. Leaving our insurance needs with Websters enables us to focus on our business with minimum distraction. We value the pro-active advice on the insurance protection relevant to our industry. 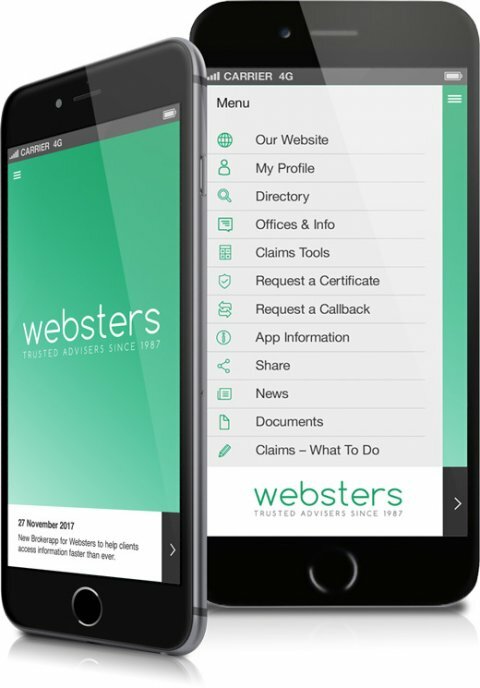 At the time of a claim Websters helps us navigate the requirements of the insurers and assists to provide a full representation of the facts to maximise our ability to claim. I’d rather have fun, make money, and build my business. It’s a no brainer. Membership of professional organisations assists us to provide the highest level of service to our clients, and for us to continue to meet the strict requirements of our Financial Services Licence. The National Insurance Brokers Association, the peak body representing Australian insurance brokers. We comply with the Insurance Brokers Code of Practice. The Australian Financial Complaints Authority (AFCA), a government body tasked with resolving disputes between customers and financial services providers. The Insurance Brokers Network of Australia (IBNA), a leading insurance broking network representing over 80 professional broking companies like ours. IBNA members collectively manage insurance with annual premium income exceeding $800 million. The AIMS joint venture between Ausbrokers Holdings Limited, a publicly listed Australian insurance broking company, and IBNA. AIMS members collectively manage insurance with annual premium income exceeding $1.2 billion. Steve takes a personal interest in his clients to provide them with holistic risk management & wealth creation solutions over the long term. Steve is a Director at Websters with over 20 years experience in the insurance industry. Passionate about understanding how his clients businesses operate, with the ability to coordinate a number of financial services, Steve is viewed by his clients as a trusted advisor. Steve is married with 3 children, once a keen sportsman, now a keen follower and a frustrated mechanic with a number of classic cars & motorbikes that are gradually gathering dust. When you become a client of Andrews you benefit from his broad technical knowledge and MacGyver like problem solving ability. Andrew is a Director at Websters with over 30 years insurance experience. Previously filling senior roles with large insurers, he sought in 2004 to engage in the more challenging field of broking and business ownership. Having been around the block a few times, there isn’t much he hasn’t seen in insurance. Andrew’s ideal client is one that appreciates his advice and values his hard working ethics. Andrew and wife Sharon enjoy supporting their 3 boys in their many and varied sporting pursuits in the local hills community, as well as the all too infrequent game of golf or fishing trip. With an emphasis on establishing long term, personal relationships with his clients, Bruce is a trusted advisor. A Senior Account Manager at Websters, Bruce has over 30 years experience in the insurance industry. Starting, as most successful brokers do, working for large insurers, Bruce moved to broking in 2011. Bruce works with all types of business owners, from small businesses to large property owners, and as an experienced audio engineer and musician, specialises in insurance for film, audio and entertainment industries. Bruce is married with 5 children, loves music and sports and is an optimistic Carlton supporter. Gavin has over 28 years experience working in the insurance industry and is renowned for being client focused and building long lasting relationships. Having worked for general insurance companies in a claims handling and claims management capacity and then as a Loss Adjuster, Business Development Manager and a National Operations Manager, Gavin is well aware of the needs of businesses and individuals and has seen first hand the devastating effects of both not insuring or inadequate insurance has their livelihoods. A father of 3 including two teenagers, he is an active member in his local community and has been a volunteer with his local Hills football club for over 10 years. Over the years Suzanne has worked across all areas of the insurance industry, including claims management. Helping people and being able to assist with their insurance needs is something Suzanne enjoys, along with the added bonus of developing valued business relationships with our client base. Suzanne has had over 30 years’ experience within the insurance industry. Starting her career working for corporate insurers, Suzanne moved to broking to deliver more client-focused service. Suzanne enjoys spending time with her family and catching up with friends, a keen sports fan and enjoys the odd bit of gardening. Louise is a true professional with an eye for detail and prides herself on delivering the best outcome for her clients to ensure their interests are protected. After 10 years at a corporate brokerage, Louise continued her career in broking with a focus on expanding her professional growth & development. Now with over 20 years experience Louise is now an Account Manager at Websters. Louise is a Senior Associate of the Australian & New Zealand Institute of Insurance & Finance (ANZIIF) and a Certified Insurance Professional (CIP). In her spare time Louise loves to travel, play netball and follows most sports. Bec believes that each client should receive a personalised service and continuously maintains the highest level of customer service, regardless of how large or small the portfolio. Bec is the Domestic Portfolio Manager at Websters with over 15 years’ experience in the insurance industry. Working remotely from home allows Bec the flexibility to work anytime. Websters prides itself on being ‘family friendly’, providing Bec the opportunity for her work & home life to coexist. Bec is married with 4 (yes that’s 4) children. She spends her downtime breaking up fights between her 3 sons and spoiling her only daughter! Bec is also a singer and performer, a love she has had for as long as she can remember. Nicole is the financial engine room of Websters, the number-cruncher. Starting as a receptionist, Nicole earned her Diploma in Accounting and is now responsible for the financial management and compliance, Nicole’s role carries great responsibility. Nicole enjoys spending time out on the water and is an avid motorsports follower. Tiffany specialises in managing the claims process for our clients by guiding them through what can be a stressful experience. Most clients judge the value of their insurance at the time of a claim. Tiffany communicates clearly with clients to ensure that they are aware of the process and to ensure the best outcome is achieved. In her spare time Tiffany enjoys travelling and having an active lifestyle through tennis, water skiing and attending the gym. Emily builds relationships with clients by making their claims experience as easy as possible. A team member since 2014, Emily completed her Cert IV in Business Administration and insurance studies and is now engaged as a Claims Manager. Emily loves to travel and spend weekends away, when at home she enjoys spending time with her friends and family.